Homemade nut milks are nutritious and delicious! And easy. If you use a high-powered blender like the VitaMix or BlendTec, straining is virtually unnecessary (but you can still do it) because it grinds the nuts to such a fine consistency. You can also make raw nut milks in a blender. The following tutorial explains those two methods, plus how to use a soy milk maker. Get video demonstrations and even more information about homemade nut milks (plus homemade coconut milk) in our online class, Allergy-Free Cooking. In each of these methods, adjust the amount of water or sweetener to make the nut milk with the consistency and sweetness you desire. Each makes 6 cups. 1. Soak the almonds or hazelnuts in 2 cups of filtered water overnight, up to 24 hours (or longer if the temperature is not too warm). They do not need to be skinned. After the soaking time, drain and rinse the almonds. 2. Put 6 cups of fresh water, the nuts, and desired sweetener in the Vita-Mix wet container (or BlendTec). Put on the two-piece lid and make sure it is tightly closed. Turn on the Vita-Mix to low, increase variable speed to 10, and then switch to HIGH. Blend on HIGH for 2-1/2 minutes, until milk is smooth. The milk will be quite foamy on top. 3. Let the milk sit for about 5 minutes for the foam to settle down. Pour contents of wet container into a storage container, such as a 1/2 gallon mason jar. To omit the 5 minute resting, pour the milk back and forth between the wet container and the storage container repeatedly to let the air out of the foam. If a grind-free milk is desired, pour contents of wet container through a fine mesh filter into the storage container. 4. Store milk in refrigerator. For a thick and smooth milk, shake well before serving to reincorporate the fine grinds that settle at the bottom of the storage container. For a thinner milk without any fine grinds, do not shake the milk before serving. 1. Soak the almonds or hazelnuts in 2 cups of filtered water overnight, up to 24 hours (or longer if the temperature is not too warm). They do not need to be skinned.After the soaking time, drain and rinse the almonds. 2. Place drained nuts in the filter cup of the soy milk maker and attach it to the motor base. Fill the pitcher with the filtered water. Put the motor base on the pitcher and plug it in. Do not use the automatic cycle of the soy milk maker. Follow the manual to set the machine to a grind only cycle, not a heat cycle. For the SoyaJoy soy milk maker, press “Motor” five times and then press “Start” once. Note: Press “Motor” firmly until you hear a beep, then press again firmly until you hear a beep, and so on. Do not press “Motor” more than five times, or your machine may overheat during the grind cycle. 3. Pour contents of pitcher through the fine mesh filter into a storage container, such as a 1/2 gallon mason jar. 4. If sweetening, pour 2 cups of the milk into a blender container and add desired sweetener. Blend well and add back to storage container. Mix well. Store milk in refrigerator. 1. Soak the almonds or hazelnuts in 2 cups of filtered water overnight, or up to 24 hours (or longer if the temperature is not too warm). They do not need to be skinned. After the soaking time, drain and rinse the almonds. 2. Place nuts and 6 cups of fresh water into blender container. Blend on high speed until smooth. 3. Pour contents of blender container through the fine mesh filter into a storage container, such as a 1/2 gallon mason jar. 4. If sweetening, pour 2 cups of the milk into the blender container and add desired sweetener. Blend well and add back to storage container. Mix well. Store milk in refrigerator. I did it! I can’t believe how great it tastes and how easy to make. I drained the little fine grains out of the milk and was wondering if you had any suggestions for uses. I have a 12 week old baby and use almond milk for my source of calcium. Do i need to add anything to my milk to keep the same nutritional value as found in commercial almond breeze? I hope you don’t mind all of the questions. I am very new at this and desire to rid the fillers out of our diet. My two older children suffer from chronic ear infections and I will do and try anything to help my little muffins. I believe it has to be an allergy to something but don’t know what. Anita, Good for you! The commercial almond milk is probably fortified. What you can do is buy powdered calcium citrate (citrate is the best assimilated form of calcium) and add it to your milk. I have never done this, personally, but I did consider it at one time. Or you can search out other forms of calcium and make sure your children are getting plenty of other food sources. The website World’s Healthiest Foods has a wonderful list that can assist you with this. The almond pulp can be added to breads, cookies, brownies, muffins… it makes a wonderful addition and no other adjustments are needed usually. Hello! 🙂 I just wonder what you mean by filtered water? And where can I get a fine mesh filter to filter the milk with? Thank you so much for a wonderful nut milk recipe!! I would encourage those who read Cathys’ comments to do their homework. One of the reasons that vegetarians (not vegans) seem so sick all the time is that they substitute the protein in meat for the protein found in eggs and milk. What you really need to look for is mucus causing foods, milk, eggs, sugar, and refined flours being the main culprits. Mucus is the “food” that germs feed on. They are Gods little garbage men. When the body has to much mucus that it can not get rid of it, it becomes a breeding ground for these germs. That is why there is no “cure for the common cold”. It is my opinion that dairy does the deserve the negative attention that it is getting. It may be bursting all right, with chemicals from overuse of antibiotics, milk producing hormones and steroids! Please do your homework. Milk is no dream food! I am making the Hazelnut Milk and have a couple of questions. I’m using a blender and my blender container is not large enough for the nuts, 2 cups of soaking water, and the additional 6 cups of water. The container holds only 5 cups of water. So, I’ve made it with less water. I’m assuming this won’t be much of a problem…it should just give me a more concentrated milk. Am I right in my assumption? You are right in your assumption that it will just make more concentrated milk. However, I realize by your question that my directions were not as clear as they should be. I didn’t intend for the 2 cups of soaking water to be put into the blender with the 6 cups of water. I have edited the recipe to include draining and rinsing the nuts after the soaking. Thanks — and enjoy the hazelnut milk! Thanks for the great recipe! I have been making almond milk for a while but I never had thought about adding dates or agave! When you soak the almonds in the 2 c of water overnight can it be in a sealed container or does it need to have an open top? Steph, I’m not sure what the limit is. Definitely smell them and rinse them well and smell them again. When I used to make soy milk, the soy beans would get to a certain point of being soaked too long and they wouldn’t make good milk. That was about a week. (I would soak a bunch and just keep them in the fridge in daily fresh water.) So, you might just have to try making the milk to find out if it is good or not. Sorry I can’t be more help. So I made my first almond milk yesterday – I soaked the lamonds overnight and blended them in the blender and strained thru cheesecloth (my nut bag arrived today – yeah)…it was creamy and delish excpept it seemed to seaparte later in the fridge – do you know why this happens – is the milk still good…I have an awesome raw choc mousse I need raw milk for so i would appreciate any insight you have. Have a rawsome day! dreaming of the day I too have a vita mix..
Hello, Shivie. I do not know why the separation happens, but it does happen to me, too. I just shake it up and it is perfect again. I read the replies re: milk vs. nut milk, as it concerns mucus. Here is what I have to add. I should add that I have been a vegetarian since the early eighties and raised two kids that way. I made my son fresh nut milk made from sunflower seeds since we were/are both vegetarians. Unfortunately, that sunflower seed milk caused a lot of mucos in him. At that time, and this was some time ago, I remember reading that sesame milk is the best nut milk of all. Never got around to figuring out how to make it. Also, I lived in Iceland for a month. Dairy is everywhere, it was the first time I ate it in a long time and I ate a lot of it. NO MUCUS response. I was shocked. I agree with Cathy, I think the quality of the dairy really matters. Thanks to Shivie for her question on why the almond milk seperates. In addition to this, the milk also smells. As I’ve just begun making it, and I’m not sure HOW its supposed to smell, can you advise me on how long it keeps in the fridge before it goes bad? Since we are all making it at home, we have to develop our own Expiration Dates. THANK YOU. Melissa, when you say the milk smells, do you mean smells badly? It shouldn’t smell badly. It smells nutty and fresh when it is good. In my experience, 4-5 days is about the most my almond milk keeps, but I prefer to use it up within 3 days or less. I hope this helps and thanks for your questions! My almonds smell bad even while soaking- smells exactly like pea seeds after a day of soaking (before being planted). Hello, I was wondering if this would work for making milks out of other nuts, such as macadamia and walnut? Would there be any modifications if so? Thank you! I would say, give it a go with the macadamia nuts. However, I have tried it with the walnuts and the milk tastes bitter, and why, I’m not sure. Perhaps if it was sweetened, it would be better. It could be from the papery shells. I have not tried with macadamia nuts, but I can’t think of any reason why it wouldn’t work. You might want to do a 1/2 batch (1/2 cup nuts, 3 cups water) to see if you like it. I don’t think you’d have to modify the recipe at all. ok…..I have read everything and will make the almond milk in my soy milk maker. Why don’t put it on the entire cycle with heat? Ernest, to put it on the heat cycle would cook the milk and destroy enzymes. This milk is best raw (but the nuts soaked to neutralize enzyme inhibitors) and very delicious. I just stumbled onto your website and love it! I am looking forward to exploring it some more. I especially appreciate all of the gluten free recipes and information, as I have Celiac Disease and have been eating a strict GF diet for 2 1/2 years. I have been wanting to try teff grain (I use teff flour successfully), but haven’t found a good source for it. I bought a GREAT nylon mesh nut bag for straining almond milk from Brigitte Mars at http://www.brigittemars.com. It works much more efficiently than the cotton one I’d been using and it dries in no time at all. I can’t seem to find it at her website, but if you email her, she will send you the info. I think it cost about $9 with shipping. Where do you order your organic grains, beans and seeds from? If they come from bulk sources, how do you ensure that there is no cross contamination? I began making my own raw almond milk about a year ago, when raw almonds were still really raw. Since then, in the US, most suppliers sell almonds that have been steamed for a short burst so they’re not really raw. When I first started making the almond milk, it would last at least three days in the frig. I took a hiatus and stopped making it for awhile and have only recently begun to make it again. I always bought the raw almonds from Trader Joe’s, only now I know they’re not really raw. I’ve noticed that in the past few months, the raw almond milk doesn’t last more than a day. I’m wondering if the steaming of the almonds has anything to do with it. It’s the only thing that I think is different. What is your thought about this? Hello, Ellen! I would love for you to share some of your teff flour recipes. Are they on your blog? I have only used teff intermitently as flour, but I add it daily to our hot cereal. I have heard of those strainer bags. I wouldn’t mind having one, but I so often don’t need to strain at all (because the Vita-Mix grinds so finely) that I just haven’t sprung for it. Regarding the raw almonds, I am not surprised at all that the flash-pasteurized “raw” almonds don’t last as long in milk form. I do not have experience with this myself, as I continue to use truly raw almonds that have been imported from Italy or Uzbekistan. I would prefer to buy Pacific Northwest or California almonds (local to my region) but in this case, getting truly raw from another country wins out. I buy them from the same warehouse I mentioned above. It is a great benefit to have that resource nearby and I wish others could share the benefit. If you’re in the Pacific Northwest and wish to know where they are, I will get you their information. I’m so happy you stopped by my site and glad that you’ve added your thoughts here. I look forward to visiting your blog soon. Go to my blog (www.Iamglutenfree.blogspot.com) and go to the sidebar where I have my recipes archived. Look under the Breakfast category at the Teff Banana Pancakes. I haven’t written out the recipe because it’s from a book that was given to me to review and I don’t the author wanted me to do that. I think if you can get your hands on teff flour and then experiment with it, you’ll find that it’s very flexible. Or if your budget will allow, pick up a copy of the book. It’s really an excellent reference and cookbook. She uses all kinds of different grains – one of the great things about the book is that she makes lots of suggestions for substitutions – kind of encouraging you to be creative. I am leary about buying any beans, seeds, grains, nuts from sources unless I can be sure that the people doing the bagging are careful about not accidentally sticking a scoop into a bag of wheat and then using the same scoop for a bag of quinoa (for example). Or perhaps they haven’t changed their gloves. I wish I could find a reliable source for good tasting raw almonds. I purchased a small amount of raw almonds from a place in California and I am not happy with them. They almost taste stale. I use a TON of almonds so I’m hoping that I can find a good source for them. I am not in the Pacific northwest. In fact, I’m way on the other side of the country in Massachusetts! I sure wish we had a large Natural Foods warehouse that we could buy from. I could join the Northeast Co-op which delivers monthly to this area (usually a drop off site at a local church), but it involves working a certain amount of hours and I’m not in a position to do that. Anyway, thanks again. I just love your site – so informative and thorough. Great job! I made my first almond milk a year ago, and now I drink nothing else. But I always hated throwing away the leftover paste, so….I made cookies! I added dried cranberries, chopped dates, raisins, vanilla, molasses, honey and cinnamon, all to taste. Put TBS size dollops on plastic dehydrator sheet and pressed them out to 1/2 inch thick with my finger. Dehydrate (90-100 degrees)until top is dry, a few hours or so, then turn over onto a mesh tray and dehydrate few more hours until outside is dry, or longer for crispier cookies. As with most every raw recipe, add whatever suits your fancy. I was surprised at how tasty these are, but gotta go easy on them because they are ground nuts and NOT low calorie. Enjoy! Cathy, please do more reaserch on milk. Think of it this way, humans are the ONLY SPECIES that drinks another species milk , and the ONLY SPECIES that drinks milk after weening. Does a Tiger chase after an elephant for its milk?? Countries that cannot get milk have lower rate of osteoporosis, while the U.S. has the highest rate of osteoporosis along with the highest rate of milk consumption. Milk has almost 300 components and is the most complex food on earth, making it the most difficult food for the body to process. Vegetables are a gerat source of easily digestable calcium. I have never been a big fan of milk, I am 45 and have normal bone density, while a same age friend is a huge milk drinker, and is on Boniva. On top of all that…..it’s DEAD food……raw or not, non-fat or not…pasturized or not…. it is an animal product and full of bacteria. Just a little “food for thought”. I stumbled onto your site as I am looking for an almond milk recipe made with Coconut Milk. I thought there was one listed here but somehow I have overlooked it. I am new to raw foods and unlearned about the entire lifestyle I have read about here. I really like to drink coffee, yes I am sure you have a comment about that however I am hoping that I can substitute Almond Milk for creamer and where can I purchase cocoa beans. I have heard that they make a wonderful hot chocolate mixing the cocoa with with almond milk. I do live in the Pacific Northwest and would love to know where the natural food warehouse is located and does it have raw vegetables? I have also started juicing however do not have a reliable source of organic vegetables. Got any tips or know of a hydroponic source? My raw nut milk recipe doesn’t call for coconut milk or coconut. I’ve never tried that variation. I have tried to make plain coconut milk before by blending shredded unsweetened coconut with water in the Vita-Mix, but it doesn’t result in a smooth milk and is time intensive to strain. If you’re talking about using canned coconut milk to make the almond milk, I think you could use some of that in place of the water in these recipes. I think it would make a delicious milk. The natural food warehouse I refer to is Hummingbird Wholesale in Eugene, OR. They’re not online; you’d have to call them (1-541- 686-0921). They don’t have raw vegetables. They carry beans, grains, seeds, dried fruit, nuts, sweeteners, oils, condiments, etc. There is a place in Eugene with which I’m not too familiar called OGC (Organically Grown Company). They are a clearinghouse/packing house for organic produce and will sell to the public, however, one has to buy by the case. I know of groups of people who go in together to split the cases. I wouldn’t recommend hydroponic vegetables, as I don’t believe that God intended for us to grow our food in water with a drip system of nutrition, nor do I know of any hydroponic sources. Healthy soil is my preferable growing medium. I don’t know of a source for cocoa beans. (Or did you mean coffee beans?) I have a great recipe for hot cocoa (or chocolate milk) using almond milk — here it is. Thanks for visiting and let me know if you have other questions with which I can help you! Thank you for your feedback, I appreciate it. Eugene is too far from where I live to get produce but thanks for letting me know about the warehouse as my son frequents Eugene. I did not mean coffee beans, I meant cocoa beans. I also appreciate your comments on the hydroponics. I once had a friend who experienced war on a ship that taught him the art of hydroponics. He has long passed. So would you recommend that I grow the fresh vegetables that I juice in a greenhouse during the winter? I live in Centralia Washington and there are not very many markets that carry fresh organic greens. Does the canned coconut milk have preservatives in it? And what would I use Coconut oil for? Friends of mine asked me to pick some up but never told me what to do with it. They live in Denver and are in the process of moving so I don’t know when they will be phone or internet connected. If you can grow your own vegetables in a greenhouse, that is fantastic! We have goals to put up a greenhouse so we can do that for ourselves. During the winter, we mostly live on sprouts that I grow indoors and any seasonal fruit/veggies I can get around here. I hope you can find the cocoa beans. As well, you might ask around locally (like the health food store, the library, etc.) for if anyone knows about seasonal local sources of produce. The coconut milk I buy only has guar gum added (as a thickener). There aren’t any preservatives. I buy the Thai Kitchen organic coconut milk. I use the coconut oil in place of oils and fats in many recipes, from cookies and muffins to chocolate sauce. I also make a wonderful coconut bark, a yummy freezer treat! You can saute veggies in it, fry eggs in it, coat your baking pans with it. Anywhere you’d use oil or butter. Very little adjustment is necessary, but usually, no adjustments are necessary (for the things I’ve tried). I really enjoyed this article and most especially those who’ve made comments here – very aware and intelligent people. On the subject of dairy – the history of the cows themselves are very important. I would only consider those who have been allowed to roam the grasslands and eat just that and no intervention with any meds or grains – esp. corn. If their line has a long history of the same, that would be a plus, as well. And the raw milk from these quality sources should be perfect. However, as each of us is an individual who has their own state of health and genetics, good milk could still be a serious problem and must avoid it. On the subject of vaccinations, I agree with a thoughtful approach of avoiding unnecessary medical intervention (though, sometimes western medicine is of value). However, there is no “scientific” evidence so far to back up the more reliable word of concerned parents who have witnessed the before and after affects of inoculations on their children. To add to the point, my sister has two kidlets that she steadfastly refused to vaccinate, but but my nephew has still been diagnosed with Asberger’s(sp.?) (high-functioning Autism), anyways. He is now 14, and in a regular 8th grade classroom. I have stumbled onto another remarkable website and PBS show called “Know the Cause,” or knowthecause.com and Doug Kauffman shares his experience and knowledge of the medical and nutritional world and backs his opinions with medical papers, guests and supplemental information. Please check it out – I feel I must tell everyone I can about this remarkable show. I have been sick since childhood and since that time I have had my illness get worse and worse for almost 40 years with quack “doctors” who were rather useless through most of it! With Know the Cause, I have implemented most aspects of his strictest diet (he has 3 phases of this diet – depending on the individuals state of health), and many of my symptoms have drastically reduced along with my weight! (I’ve lost 60 lbs without really intending to – I needed to, but that wasn’t why I started the diet). How long is it expected to last? I go through blenders every 3-5 years and am paying less than $30 for each! With those #’s in mind, I’d expect quite a long performance record for the Vita-mix. Please let me know!! I hope this wasn’t too long for y’all – thank you for this opportunity to share! Hi, Enfinity. I would like to hear more about the knowthecause.com diet. I will look into it! I have had my VM for going on 7 years now. I have heard of people having them for a lifetime. It could be that parts are necessary now and then. .-= Angela´s last blog post… Donate a Lunch Just by slipping a note in your child’s lunchbox =-. I have learned that humans cannot generally use and digest milk from cows, because it contains casein, which the human body cannot digest. It also contains lactose, which every human on the planet is, on some scale, allergic to. Your body simply cannot digest or utilize either one. In fact, research has shown that the only type of purchasable “mammalian milk” that humans can readily digest, because of the lack of the presence of these two compound ingredients, is goat’s milk. Doesn’t make sense? Google lactose and casein, their chemical compounds, and their harmful interaction with the human physiology. Stephen – Have you read “Devil in the Milk” by Keith Woodford? I do not agree that humans shouldn’t drink cow’s milk. Raw cow milk (preferably from a pastured, naturally raised animal) contains its own lactase, to facilitate its own digestion. Also, when cultured, the lactose is eaten by the bacterial/yeast culture, leaving very little to trouble the human. If someone can’t digest casein, that is a different story. ummm…no one can digest casein it’s a plastic compound. There are many studies available to those willing to read the right material that proves Stephens point. I am in your ecourse at the moment…..loving it and love your site – so many great recipes, I wish I had more time. I am trying really hard to help heal my 4 year old from colitis! Just wondering about this almond milk, can I use the sprouted, dehydrated almonds or is it best to use raw almonds? This recipe includes an overnight soaking, so you can start with raw almonds. If you wanted to use your soaked/dehydrated almonds, you can skip the soaking stage with a Vita-Mix, but with another blender, you’d want to resoak them for a couple hours to soften them up again. I’m so happy you’re enjoying the eCourse! I hate to give unsolicited advice, but the almond skins should definitely be removed, and the almonds soaked longer, 36-48 hours at room temp. Almonds are quite high in tryptin inhibitors, phytates and other chemicals harmful to humans. That’s why they can sit in the ground for decades without decomposing or being eaten by insects. Antinutrients in raw almonds literally remove micronutrients from your body, in addition to making the almonds micronutrients unabsorbable. These Compounds are all greatly reduced by long soaking and discarding the bran, ie the skin. Eric – I’m glad to hear your advice. Thank you for sharing it! But, according to raw-food-living.com, “The soak water will contain the enzyme inhibitors which is very acidic to the body so make sure to rinse your nuts and seeds well.” You might want to amend your recipe. .-= Amber´s last blog post… AmberMcD: @vegangoodthings @sssonya Thanks for the tips! =-. Hey, Amber! Thanks for pointing out my inconsistency. You’re right, and I’ve needed to update the post for some time. I just did. I have found a filter basket at wall-mart for my coffee maker(so i do not have to keep buying the paper filters) i find that it is perfect for filtering out the bits of almond pulp from the milk. My almonds are not raw or organic, they are Kirkland ones from Costco. I know they are not the best but I want to use them up before I buy raw ones. Do I still need to soak them even though they are not raw. I soaked overnight and made almond milk a few times and it comes out ok but it smells and tastes yeasty. Is that how it is supposed to smell and taste? I did not add sweetener or anything, just almonds and water. Hi, Wardee. Just reminding you to please check about whether i need to soak nuts that are not truly raw and if almond milk is supposed to taste and smell slightly yeasty. Natira — Okay! I found some information, and I think it is right. At least it is what I wanted to say but wasn’t sure. I think you *shouldn’t* soak not-raw nuts, at least not for very long periods of time. If they’re not raw, they won’t germinate. Long soaking is actually a germination -mimicing process that neutralizes enzyme inhibitors. If a nut won’t germinate anymore (because it has been cooked) then the soaking will just cause it to spoil. Now there are organic almonds that are H20 pasteurized (steam) for just a few seconds that will still germinate. Those are fine to soak. Nuts, including almonds, which are pasteurized with chemicals are among those that are likely to spoil in long soaking periods. What is a long soaking period? I’m not sure. I would suggest a few hours, rather than 7 to 8 or overnight. Your other question — smelling slightly yeasty. Is this after soaking or did you make the milk with unsoaked almonds? Its after soaking overnight. The almonds smell a bit yeasty and when I make the milk its smells and tastes yeasty. Nut milk is a great alternative if you are wanting to try something new. 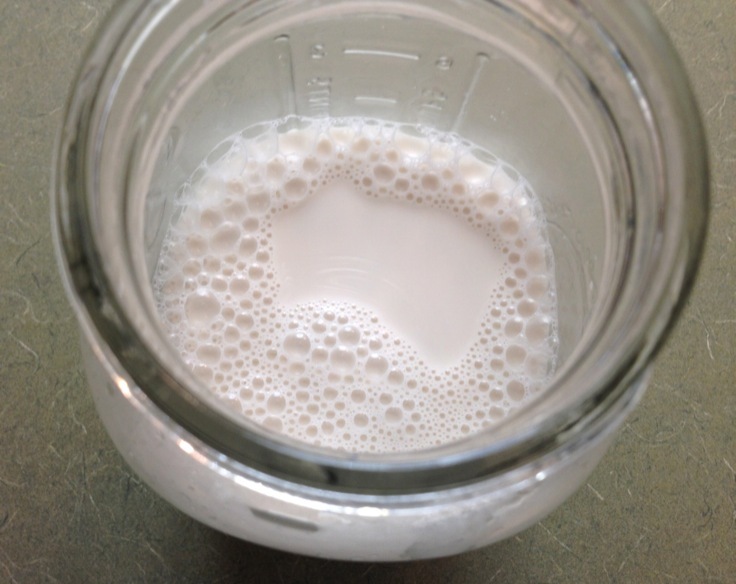 On the subject of raw milk…If it works for you and you like it…Drink it! Either you believe in raw milk or you don’t. One thing is for sure…People should have a choice to drink or eat what they please. I have been drinking raw milk for over a year and have nothing to say but good things. Raw milk does have A LOT of nutritional benefits…Someone who has suffered from Crohns disease for 6 years can tell you raw milk has saved my life. I love raw nut milk too. It’s all great and it’s all a heck of a lot better than the crap you buy in the grocery store! Well said Lizzy. 😉 My husband was on Rx meds for acid reflux and IBS before we went with raw milk so many years ago. The man is off ALL of those. He would be in crippling pain and on the floor when he had a flair-up and at one point I thought he was having a heart attack at a young and trim 30. Reflux is scary! He has not had *one* since going with raw pastured milk. I don’t know where we’d be without it. To each his own; I agree!!! Have you made flax milk? Do you have recommendations for that? My son is allergic to nuts and eggs and has no source of omega 3 in his diet.